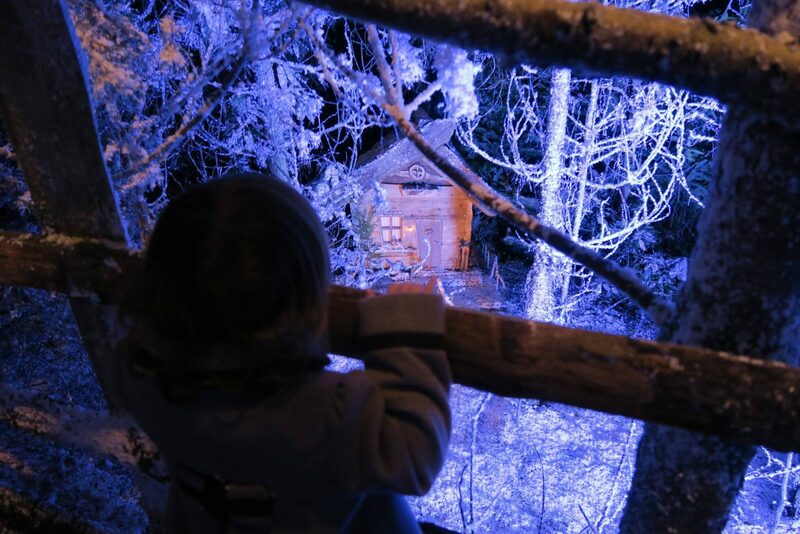 A Trip to Lapland UK…The Most Magical Place! I’ve talked before about my love of Christmas and how as a family we have lots of family traditions. Of course one of those traditions is going to visit Father Christmas. We’ve been to several places over the years, but there was one place that I’ve been wanting to take my girls. 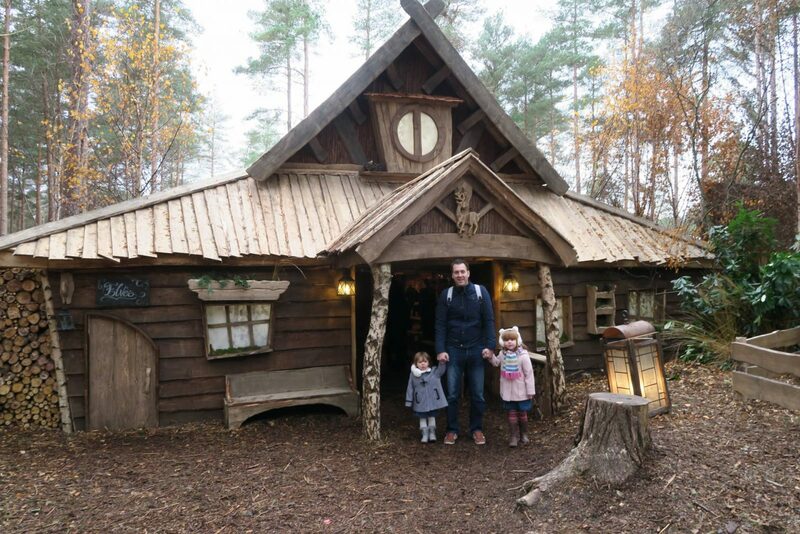 A place where the magic really does come alive and everyone that has been comes away wanting more… And that place is deep in the Swinley Forest, just outside Ascot….Lapland UK. I can honestly say I’ve never been so excited to go and see Father Christmas, from the minute the experience started I had butterflies in my stomach about the day ahead. Let me take you back to the begin of this wonderful experience. It all began with a knock on the door and two little girls running excitedly to see who it was. They weren’t greeted not by a person, but two envelopes placed on the doormat. They ran back in desperate to know what they were, Alice had read their names and had spotted the Father Christmas stamp. They waited holding their breath as I read the most magical letter to them, Alice’s eyes getting bigger and bigger with joy and excitement. You see there has been so many good children this year they have fallen behind with making the toys and they’ve chosen Alice and Holly, along with lots of other children who’ve been good this year to go and help the elves. In typical Alice style her response was ‘But I haven’t been good mummy’. Well, what do you say to that? The experience starts in the car park, which are named after woodland animals and we made our way through the enchanted forest. We arrived a large lodge building and headed inside. Even the checkin was magical with the elves using scrolls with iPads hidden inside. 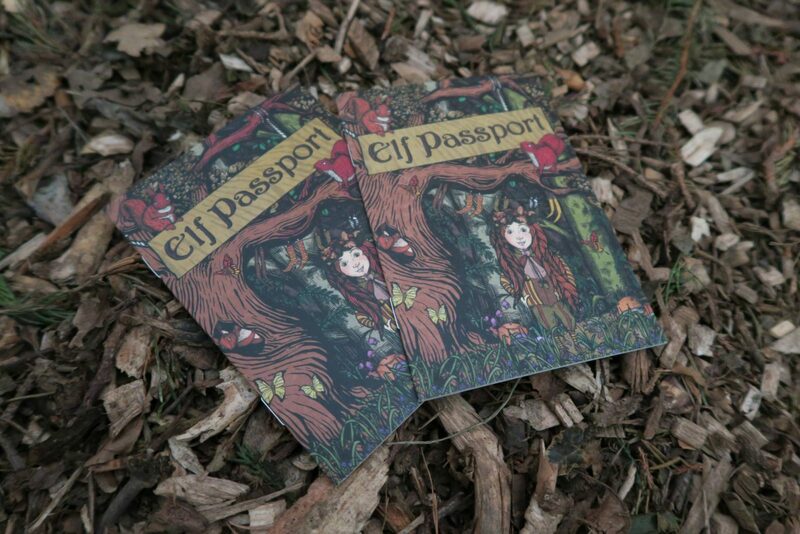 The girls were each given an elf passport and told they have to collect their stamps as they make their way through Lapland to be able to see Father Christmas. 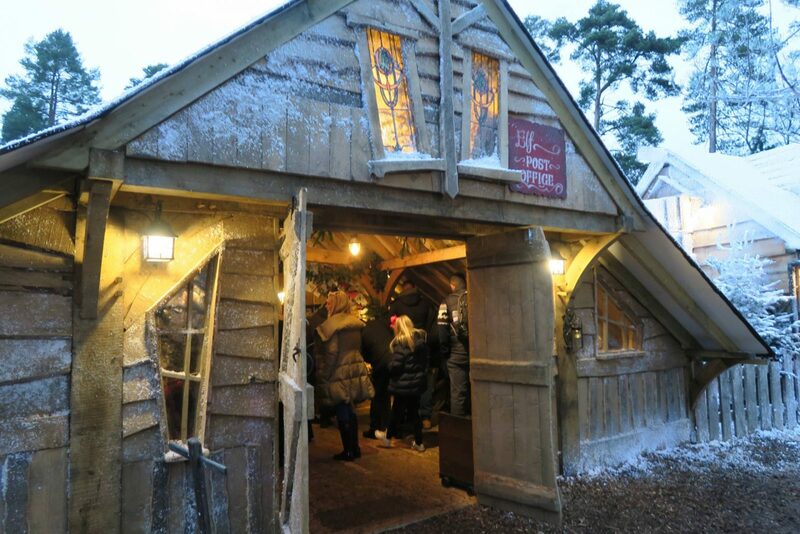 At Lapland you can only use jingles to pay for things, no cash. Don’t panic if you run out though, as you can pay with card too. Alice loved having her own money in a little velvet bag. Its all these touches that make it extra special. 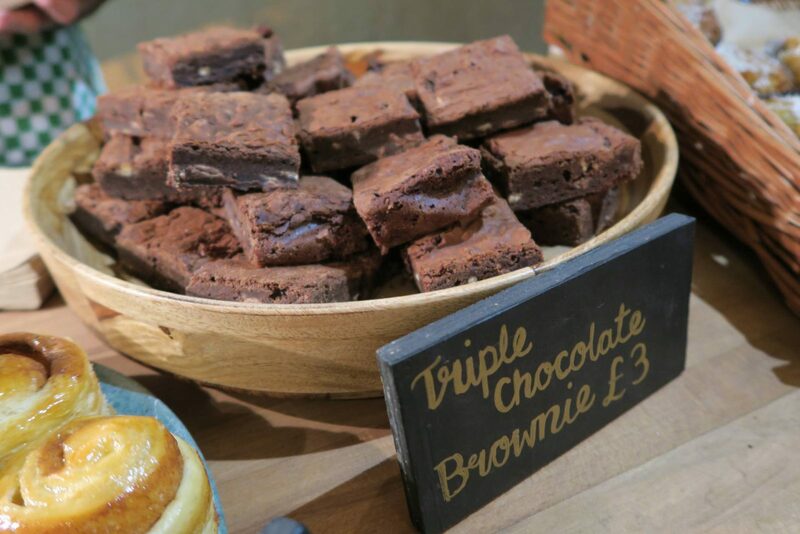 There was a cafe here too, one that took actually money, and we had a drink and a chocolate brownie while we waited. The tours take place every half an hour and there are two tours, the reindeers and the husky. We were in the husky group. Then the door opened and we were led into a large room, with benches to sit on. There was an elf pondering around and he started to tell the boys and girls all about the elves and how they came to be. Alice was amazed that they were born from pine cones. He was joined by another elf and together they did some songs and the magical door to Lapland opened and our adventures could begin. In a lot of the wooden houses throughout Lapland they have big doors, for the big people and little doors, for the little people. It was so cute watching Alice and Holly walk through holding hands. We had arrived at the Toy Factory and all the children had to sit on a bench with a table. There were benches around the back for all the big people to sit on. The children were shown by the elves how to make the toys and then baskets were passed out to each of the children. They had to make both a Rudolph the reindeer and a wooden teddy bear. The girls loved doing this. Holly needed some help, as she is only two. But Alice who is four, managed most of it on her own with just a bit of guidance. Once they had finished they took their toys to the elves for them to be wrapped up for the children of the world. I loved that they both were quite happy to pass the toys over, they didn’t once ask to keep them. They knew why they were there and they were happy to help the elves. We arrived at another house and it was no ordinary house, it belonged to Mother Christmas. Alice was so excited, as she had never met Mother Christmas before. This time the children sat at the front on benches and Mother Christmas was sat waiting for them. Around the edge were tables laid out ready for the children to decorate their gingerbread man. 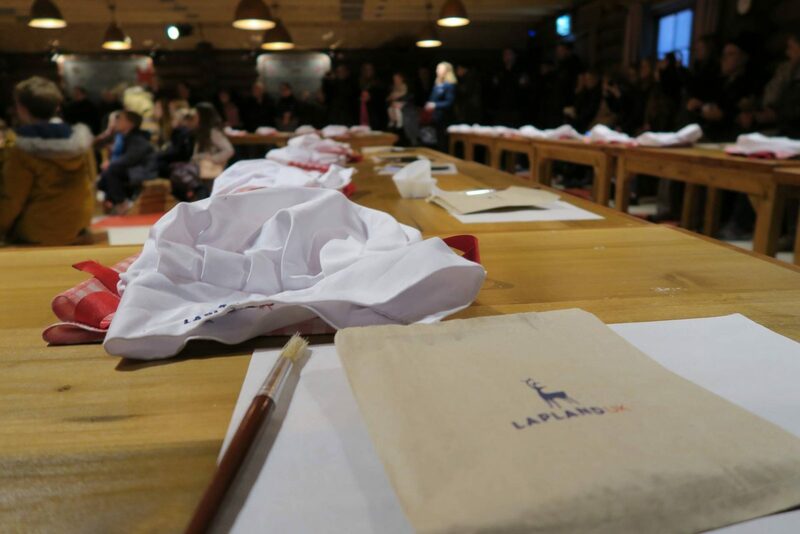 This was the girls favourite part and they looked so cute in their aprons and chef hats, that were too big for them. 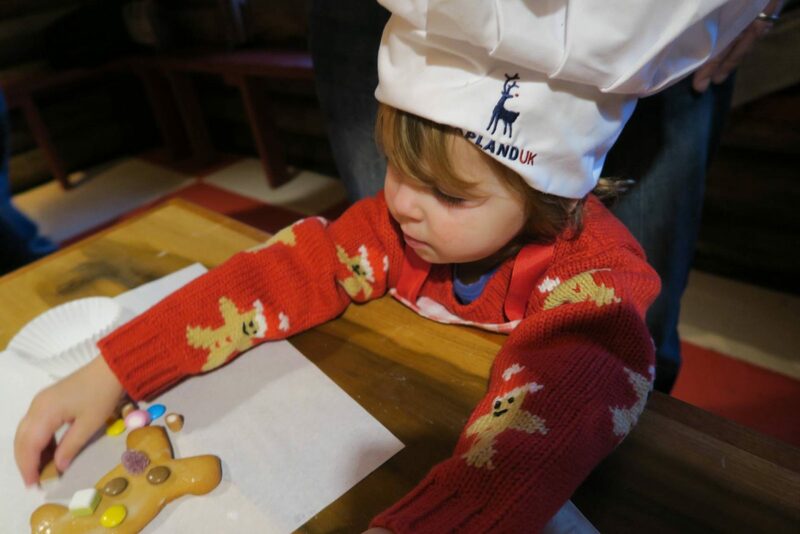 My little Holly looked adorable in her gingerbread man jumper, decorating her gingerbread man. Once they had finished we wrapped them up to take home with a promise to Mother Christmas that we wouldn’t let Father Christmas eat them. The children then gathered back round for Mother Christmas to read them a story. Each of these sessions lasted half an hour each, which was just the right amount of time to keep their interest. 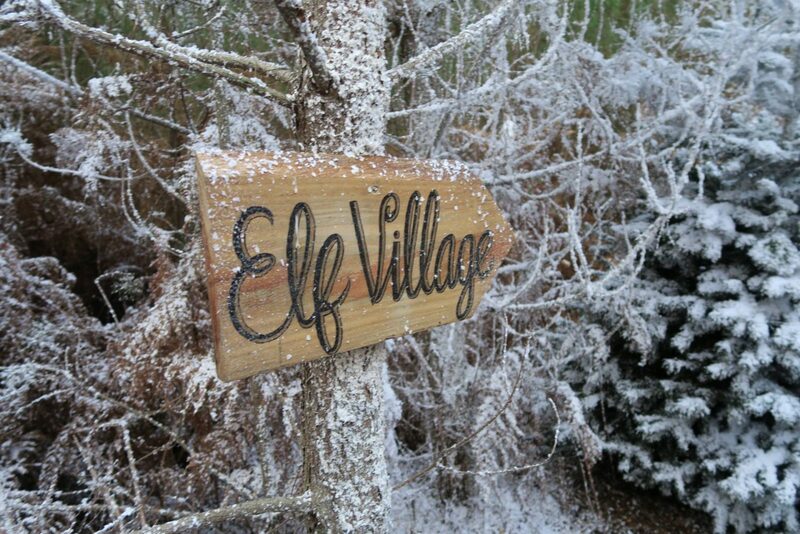 We were then led to the Elf Village, here we had ninety minutes to explore as we wished. There was ice skating, the post office to write a letter to Father Christmas, gift shops and places to eat. Alice and I headed straight for the ice skating. There was only a short queue and we were then on the ice. There were penguins available for the little ones and we managed to get one straight away. Andy and Holly watched us and also had a wander around to see the husky dogs. Once we were off the ice, we went to the post office to write a letter to Father Christmas. 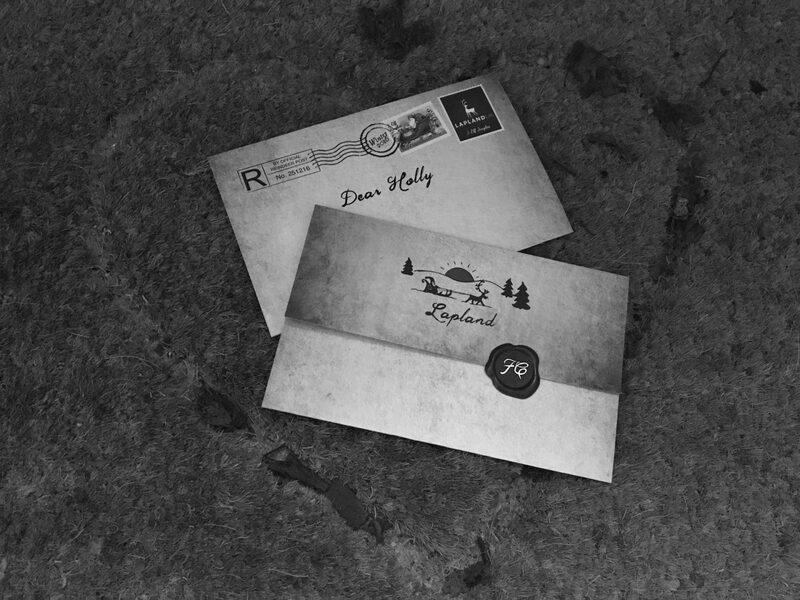 The paper was the same as the letter that arrived inviting the girls to Lapland and Alice being the observant little girl that she is, spotted this straight away. We then got our stamp and the girls posted the letters in the post box. 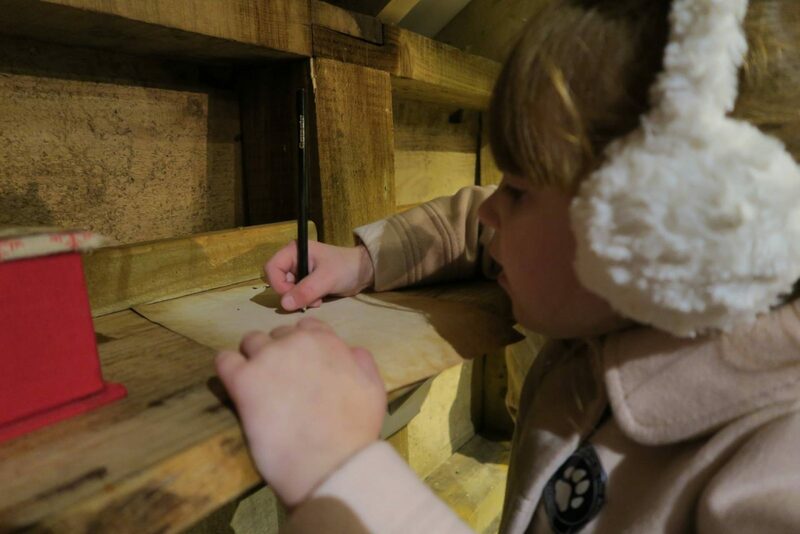 I think this was one of Holly’s favourite parts, she is obsessed with letters at the moment. You can also exchange any unspent jingles here too. 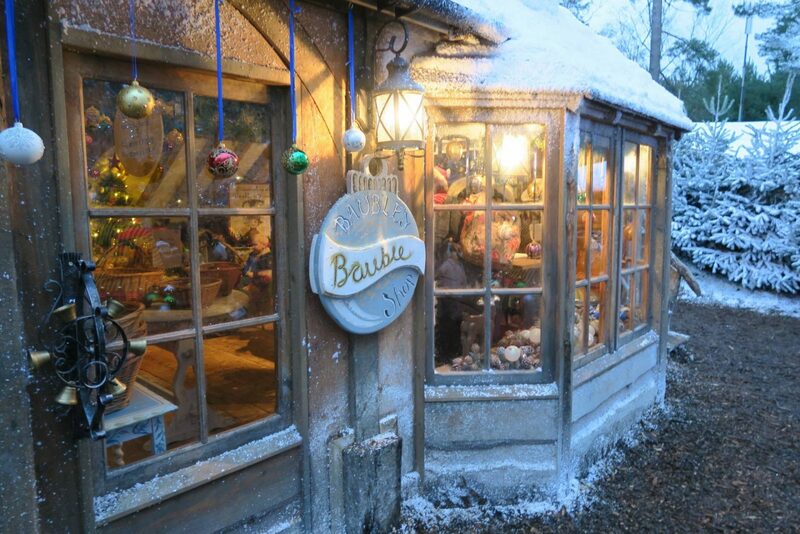 There was a lovely Bauble Shop, owned by the fabulous Bauble elf, who was dressed like a bauble. They had the most gorgeous decorations. The Elf Emporium is a toy shop, filled with the most gorgeous toys. 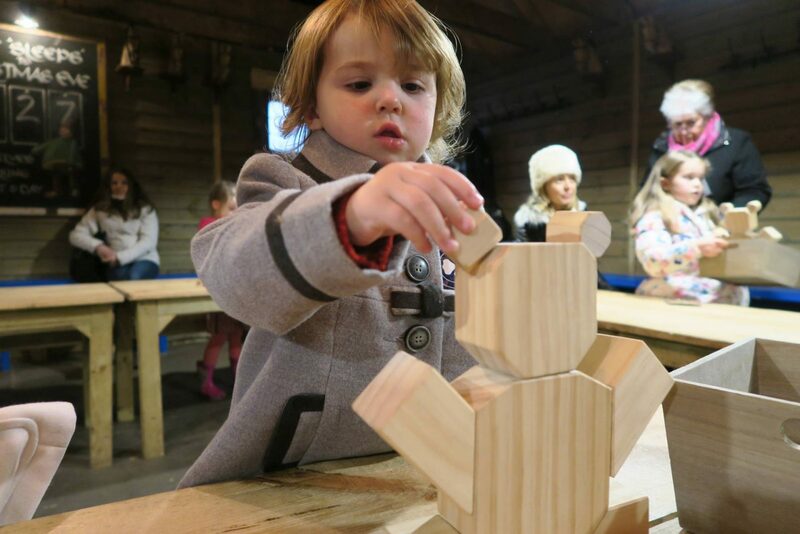 From wooden cars to elf outfits, there was something for everyone. They also sold the Rudolph the Reindeer and the Wooden Bear that we had made back in the Toy Factory, if you wanted to buy them. Or your child wasn’t happy about giving the toys back! 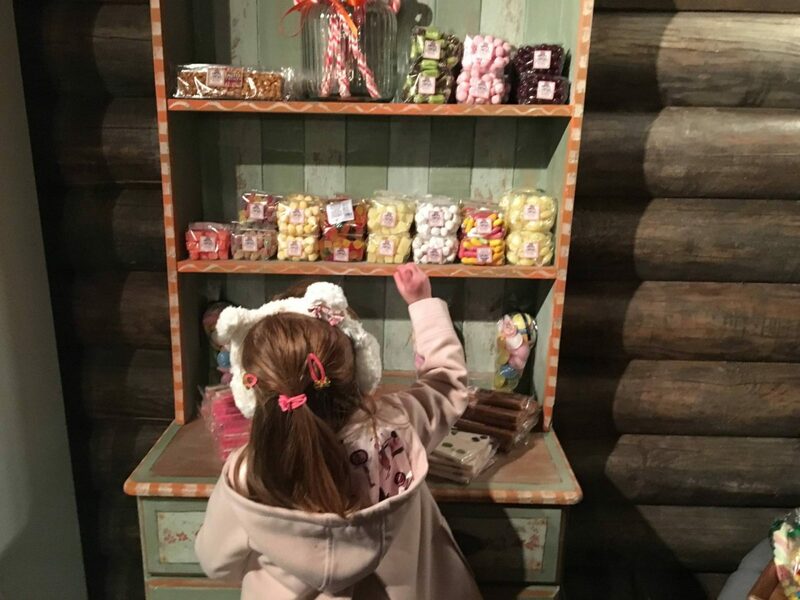 My favourite shop was the old fashioned sweet shop. It had a train circling the ceiling that Holly was mesmerised by. They had pick n mix sweets (my favourite), candy canes, gold coins and gingerbread. It even had the old fashioned scales, it is these little touches that I love. 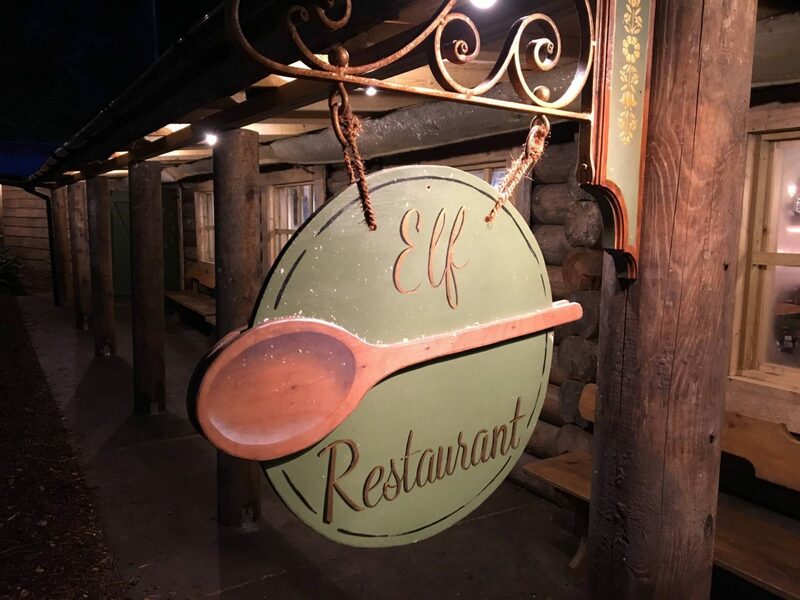 We headed to the Elf restaurant for some food. The girls had a fish finger sandwich and chips and Andy had the meatballs and mash potato, which he said was the nicest meatballs he has had. There wasn’t a big choice of food and as you would expect at a place like this, it wasn’t cheap. For a family of four, you are looking at about £40. There was a lovely Rudolph the Reindeer with an elf, that you could have your photo taken with. 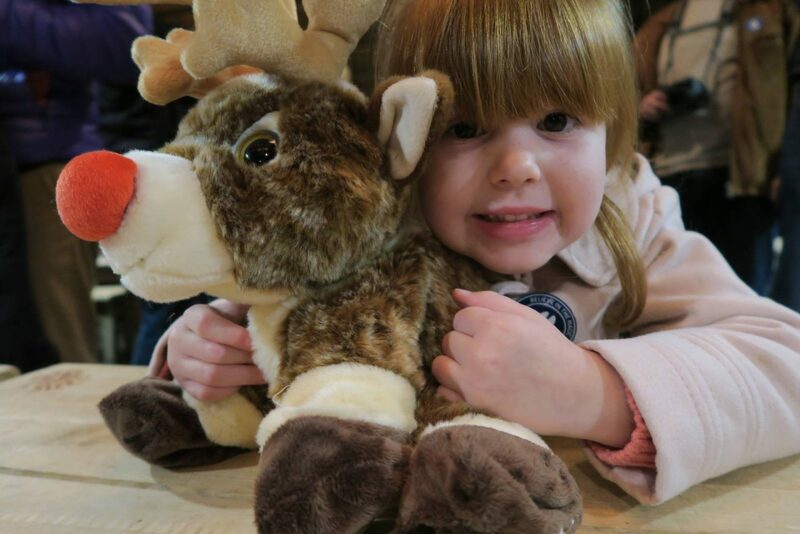 In the queue, Alice whispers to me ‘You do know that’s not a real reindeer mummy’, no flies on this little girl…. By this time it was getting dark and the elf village looked really pretty and even more magical all lit up.Even if it meant it was harder to capture photos of it all. But I would definitely go back at this time of day, as it really did add to the experience. Our tour started at 2pm and we arrived at the elf village at 3.30pm, with it turning dark about 4pm. It was then time for us to go and see the big man himself, the bit we had all been waiting for. 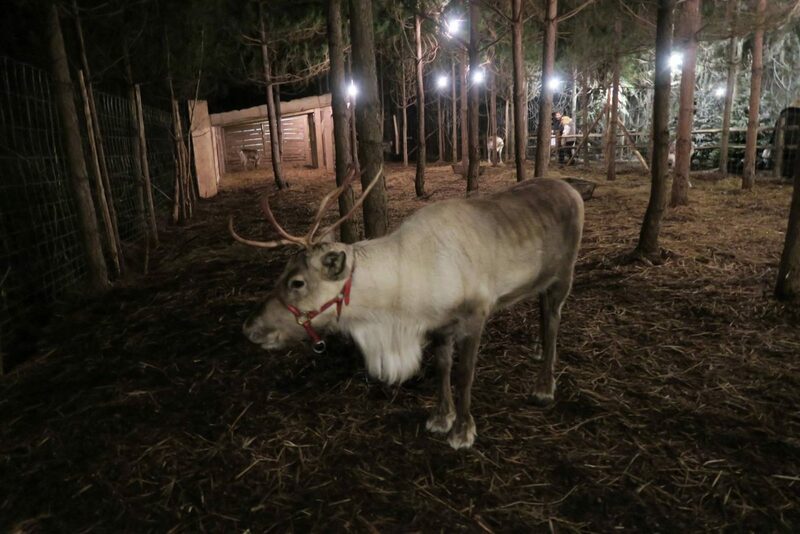 We walked further into the enchanted forest and along the way their were reindeers , real ones this time! And you had the opportunity to make some reindeer food, this cost 3 jingles (£3). Then you carried on and arrived at a house and here the children had to sit down and an adult had to go and check in. The reason for this, is they check all the information that you entered about child before your visit is correct. Of course you don’t want any little ears overhearing this. We didn’t have to wait long until an elf arrived and called the girls names. 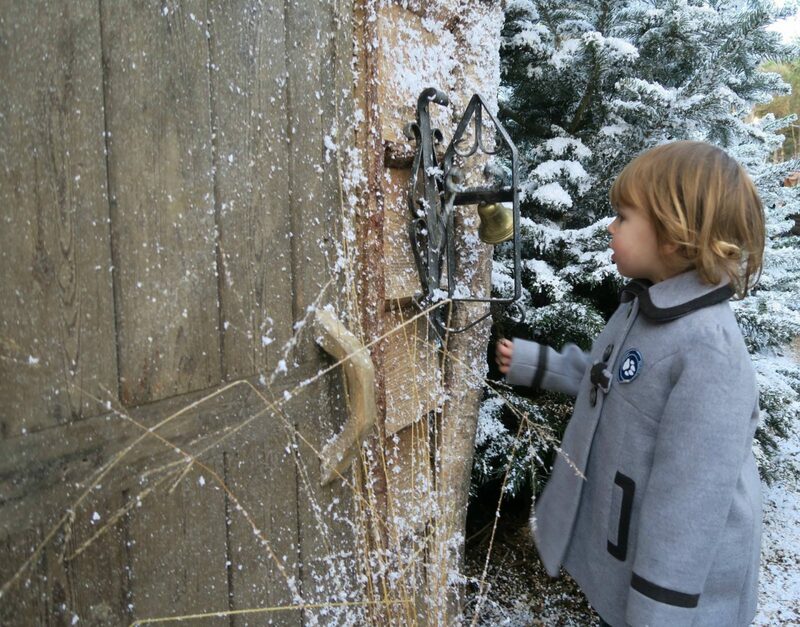 Our elf led us through the forest, chatting away to Alice and we arrived at Father Christmas’s house. It was just what the five year old in me would have expected his house to look like. There was a fire and he was sat in a big arm chair and it was very cosy and warm. Alice went and sat next to him straight away, but Holly wasn’t too sure and sat over to one side with Andy. It was lovely watching and listening Alice and Father Christmas having a chat. She couldn’t believe that he knew about her going ice skating with her cousin and that she liked swimming. Holly was starting to warm up to him and he asked her about her ballet. Then it was time to see if the girls had made it onto the good list. Well they found Holly’s name easily, but it took a while to find Alice’s. It was wonderful watching her look through the list with him, trying to spot her name. Thankfully they both made it onto the good list, I would never have guessed! Of course when it was present time, Holly was more than happy to hop of daddy’s lap and go and collect it. She then sat with Alice and they all had a chat together. Holly was adorable and I managed to get a photo of the two of them with Father Christmas. As we went to leave the girls got the final stamp in their elf passport and were given a lovely book all about the story of Father Christmas, to be read on Christmas Eve. 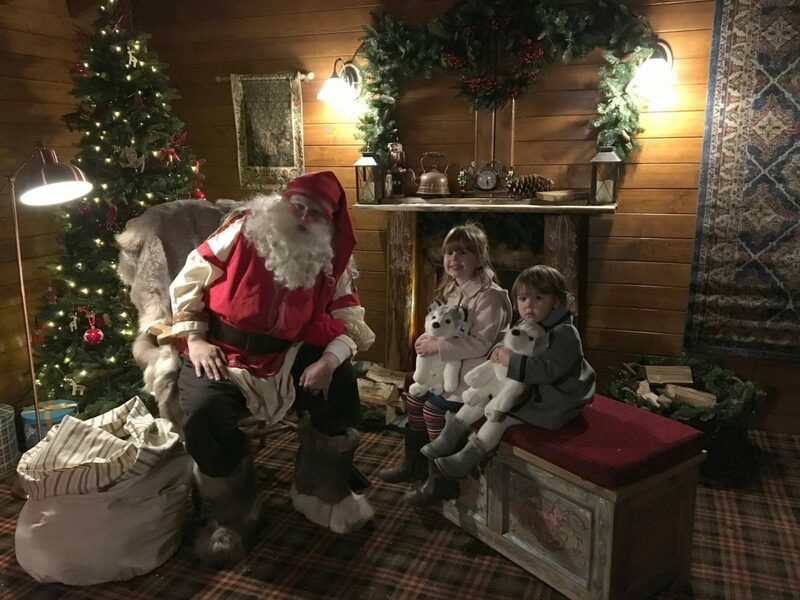 We made our way back through the enchanted forest and arrived a hut were you received a photo taken with Father Christmas, the first photo is included in the price, you can’t choose the photo you want. You can buy additional photos if you wish too. The whole experience lasts 3 1/2 hours and I think they have the timings just right. The price? 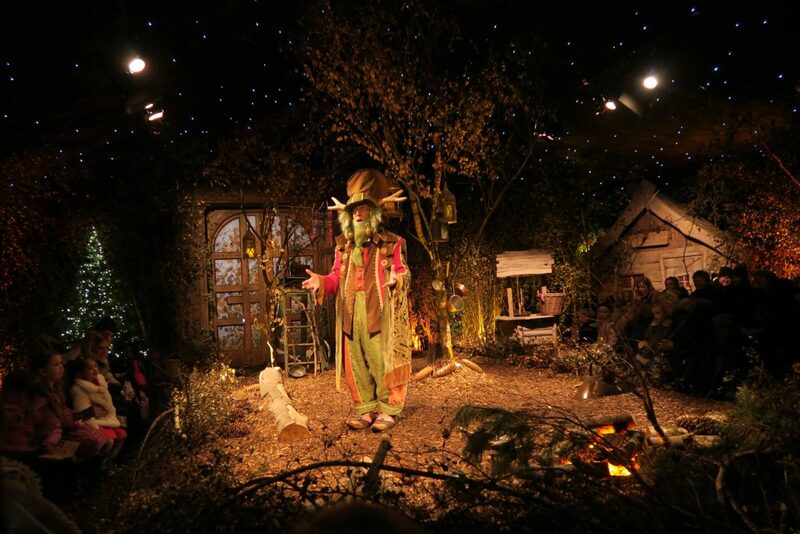 Well yes, it’s the most expensive Father Christmas experience that I have come across. At £65.50 – £95.50 for a standard ticket for anyone over the age of 12 months, that isn’t cheap. But then I always take my girls to see Father Christmas and then also take them ice skating, so when I add the price of these two together it’s not that much more to go to Lapland UK and do it all together. Plus we got a whole lot more! 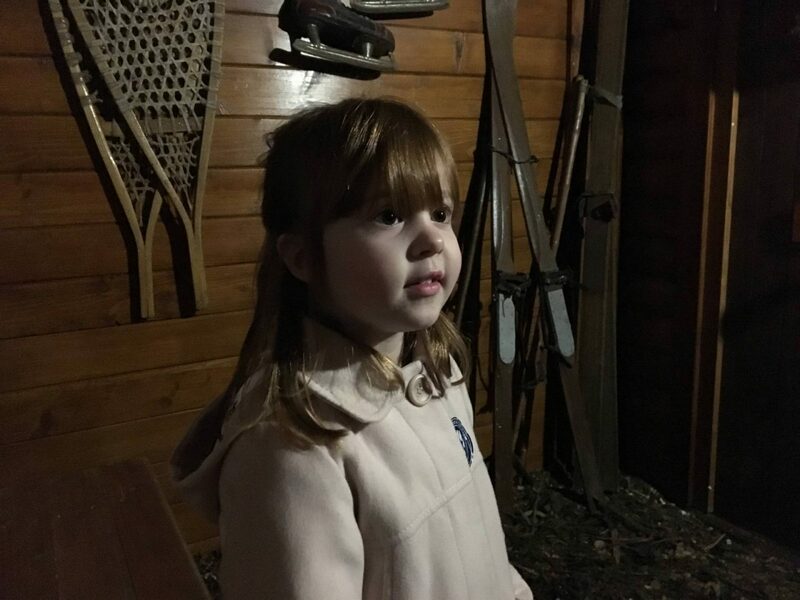 Before we went I have to say that I thought Alice was more suited to it, at age 4 and having now been I do think that 4 and upwards is the perfect age. But, Holly who is 2 years old just loved it. The whole magical experience was not wasted on her. She joined in with it all and apart from getting a bit tired towards the end. It really was the a magical family day out. I’ve made a short video of our day out, to really capture it all. 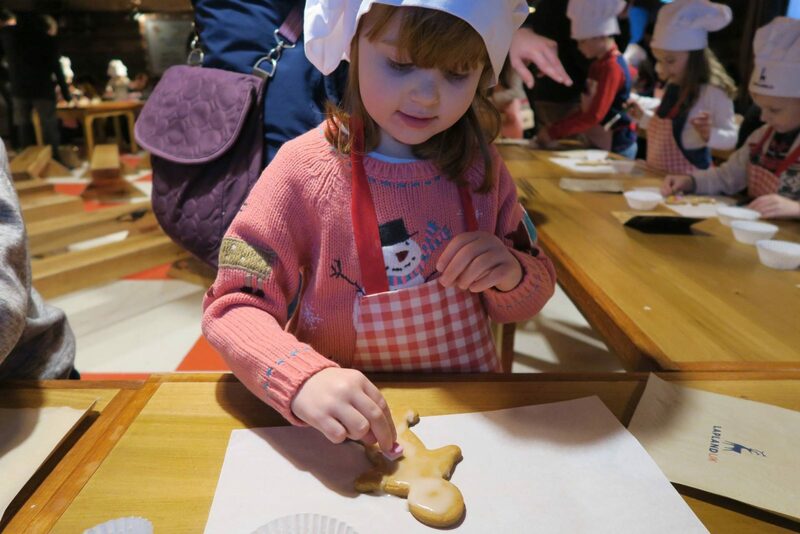 Disclosure: We were invited by Lapland UK to visit and we would like to say a big thank you to them. All views and opinions are my own. This sounds amazing. Just perfect if you’ve got little ones. It looks really well done and very magical (especially at night). I would have loved this as a kid. This looks so much fun, great pics! Oh this looks so fabulous. It’s a long way for us but reading your review has really made me want to go. Your photos are just magical. I’m really glad you all had such a brilliant time. This has just brought it all back, such a gorgeous post! And I love love love the video! They’re both so cute wearing the chef’s hats, and like you, I was amazed when Max just toddled up to hand over his reindeer and wooden bear! They might be little, but even the two year olds totally understand everything. Father Christmas was so good, it was the moment where he started mentioning all those little things that Max completely warmed up to him. Wow it looks utterly magic, I wish that we could have gone but it was just too far. It looks amazing, but sooo expensive. 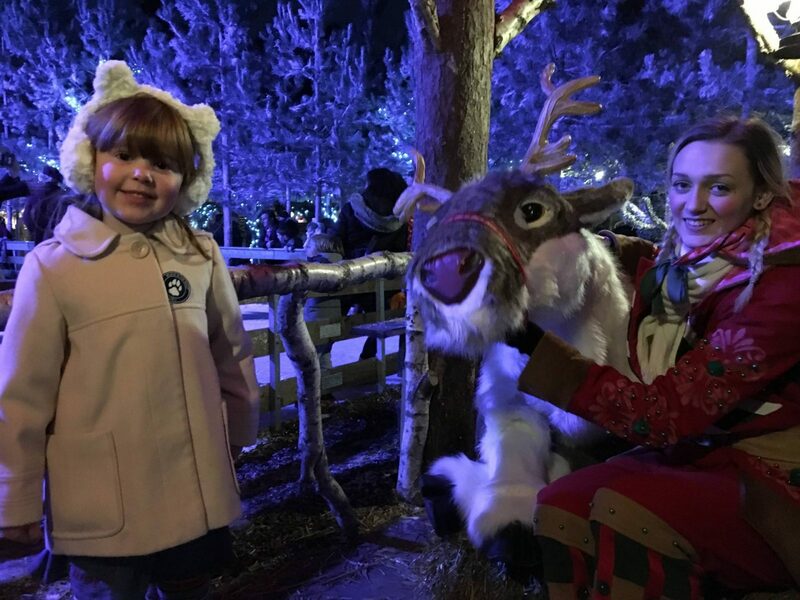 When I think that we can go to a nice grotto experience, with reindeer, santa, meeting elves, making reindeer food, story reading, presents for around £10, followed by ice scating at around £11, I’m not sure it would be worth it for me. Oh wow this place looks amazing! The price made me gulp a little bit, but as a one off the childhood memory would be priceless 🙂 Loved your video too.